Brendan Desetti Legislative Liaison ACTE What to Expect at NPS. 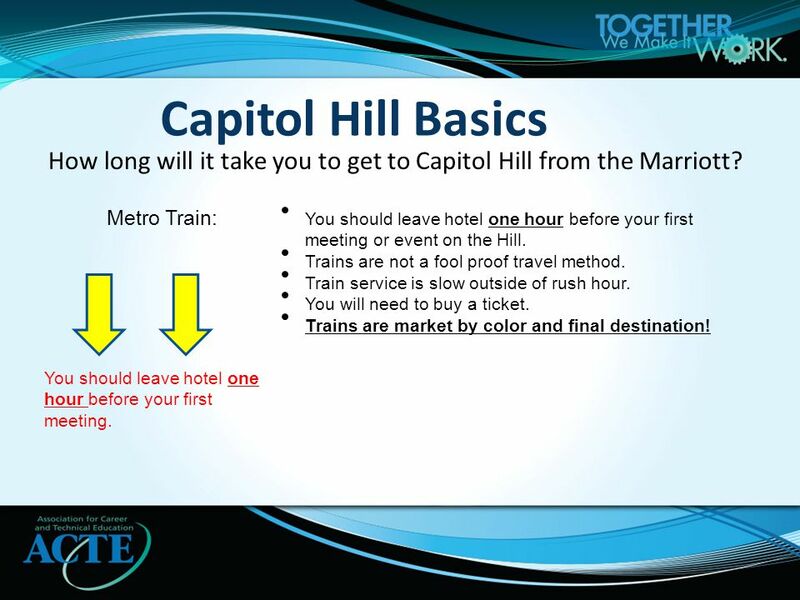 3 Capitol Hill Basics How long will it take you to get to Capitol Hill from the Marriott? 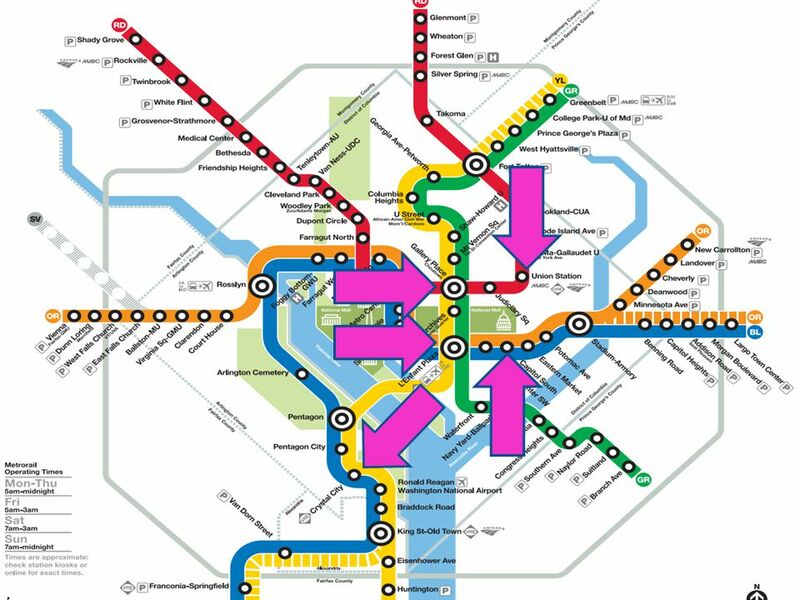 Metro Train: You should leave hotel one hour before your first meeting. You should leave hotel one hour before your first meeting or event on the Hill. Trains are not a fool proof travel method. Train service is slow outside of rush hour. You will need to buy a ticket. Trains are market by color and final destination! 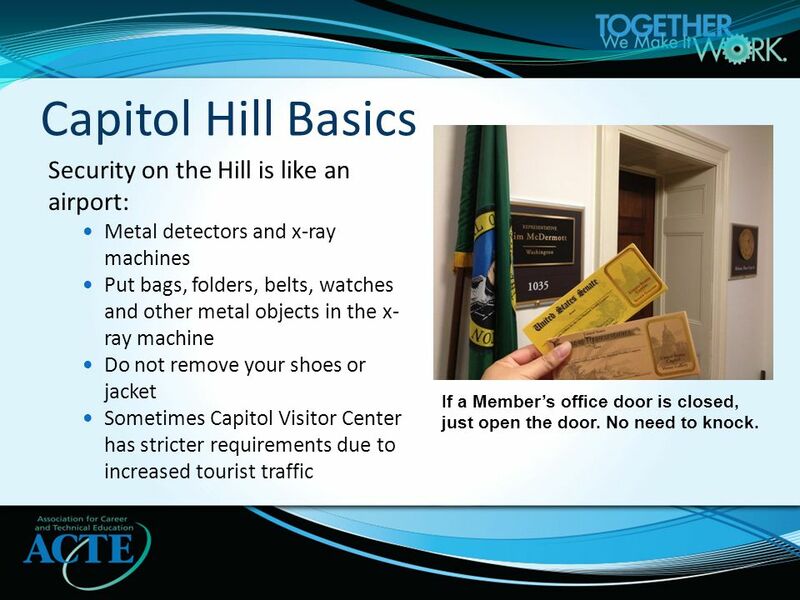 4 Capitol Hill Basics Security on the Hill is like an airport: Metal detectors and x-ray machines Put bags, folders, belts, watches and other metal objects in the x- ray machine Do not remove your shoes or jacket Sometimes Capitol Visitor Center has stricter requirements due to increased tourist traffic If a Member’s office door is closed, just open the door. No need to knock. 5 What sessions should I attend? 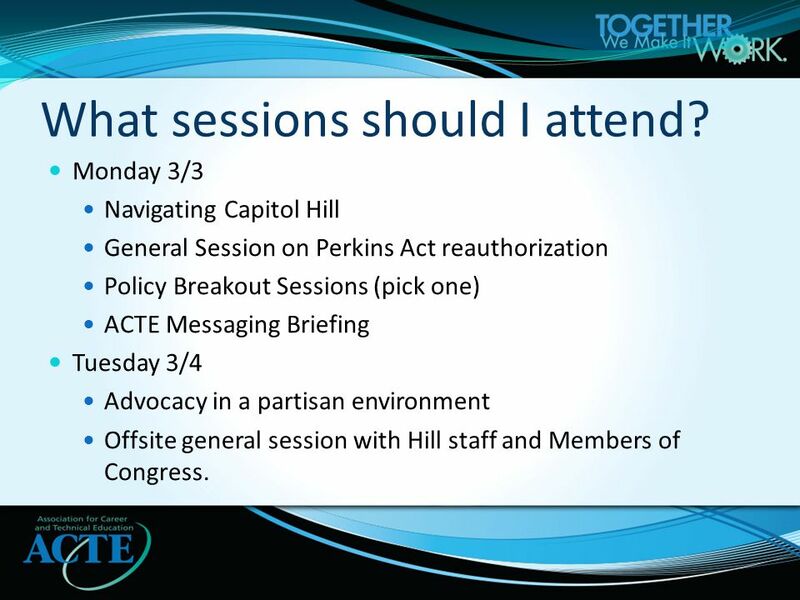 Monday 3/3 Navigating Capitol Hill General Session on Perkins Act reauthorization Policy Breakout Sessions (pick one) ACTE Messaging Briefing Tuesday 3/4 Advocacy in a partisan environment Offsite general session with Hill staff and Members of Congress. 8 How can you prepare? Know about the legislative topics being dealt with in Congress right now. 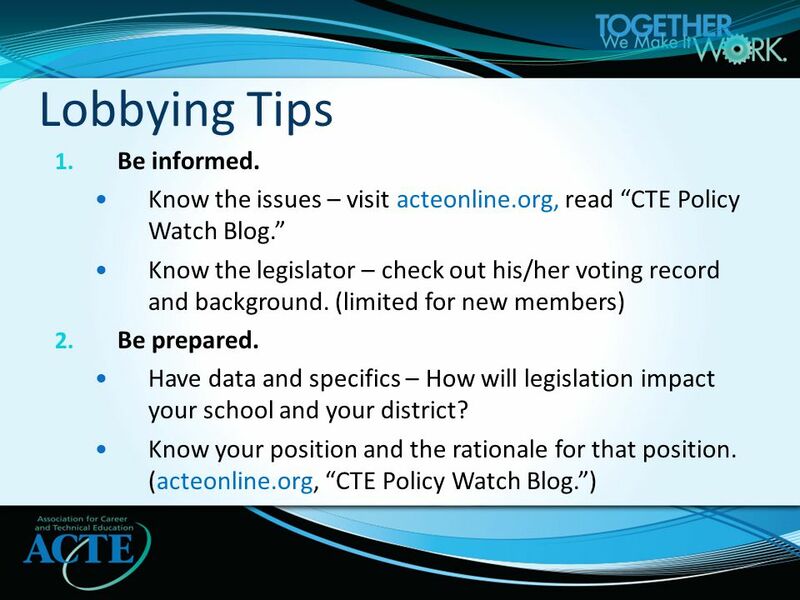 Find info on ACTE’s Policy Watch Blog. 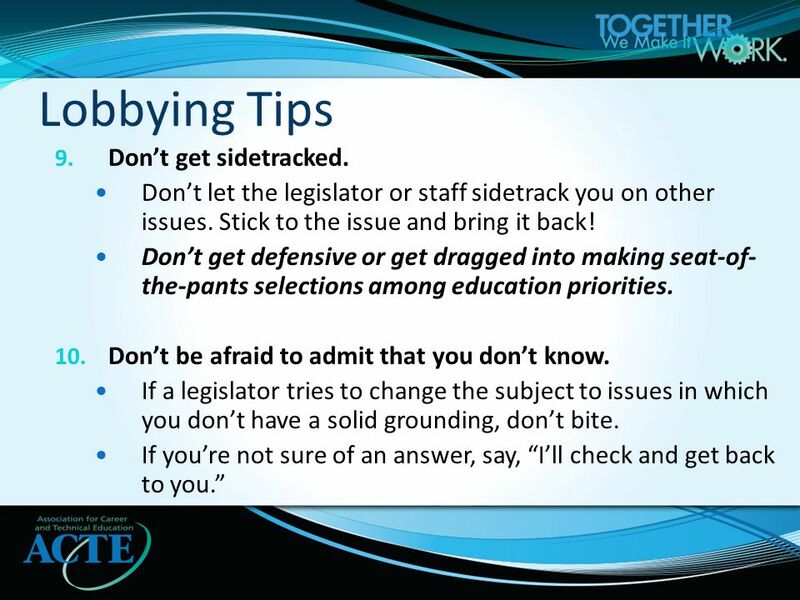 Know your Member’s priorities for education. Check out their official websites. (ex. 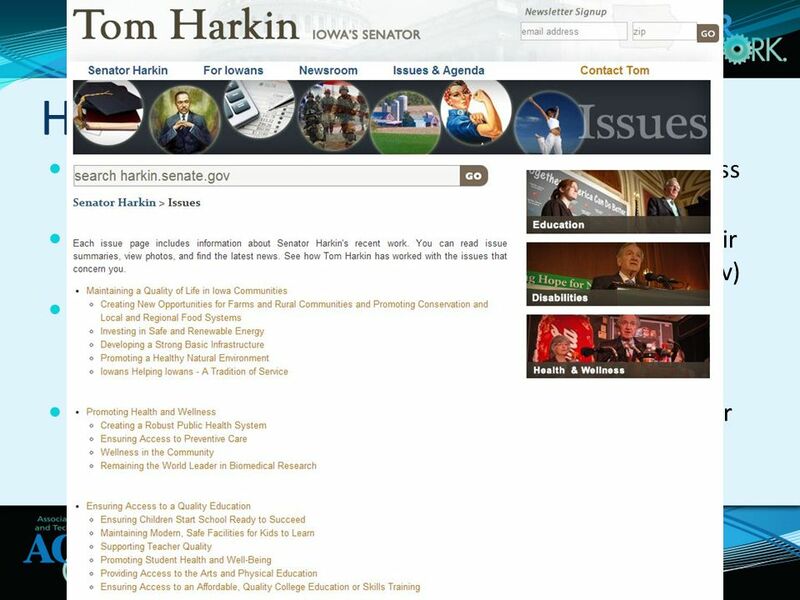 harkin.senate.gov & braley.house.gov) Know your CTE story. Come prepared to talk about your experience in CTE and how it has prepared you to be college and career ready. If you have data on your schools or programs to support your story, bring it along. 18 What is your message for Congress? 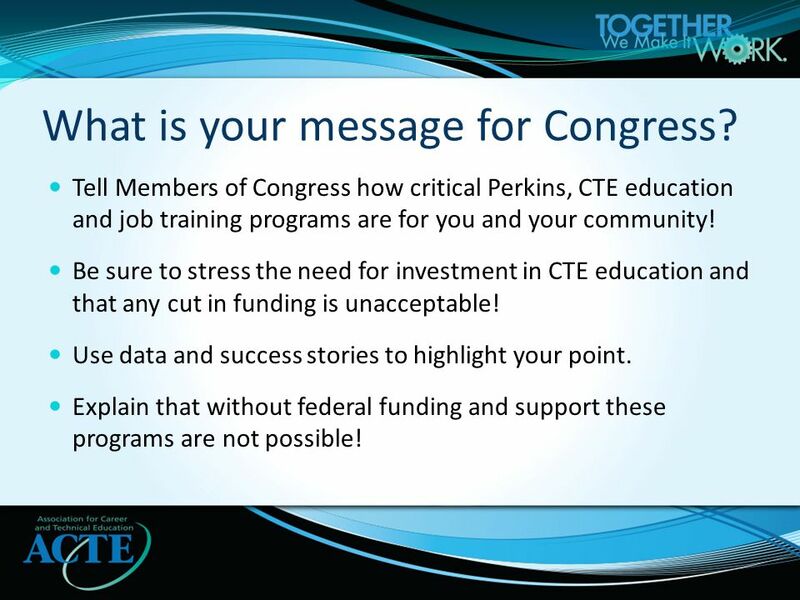 Tell Members of Congress how critical Perkins, CTE education and job training programs are for you and your community! 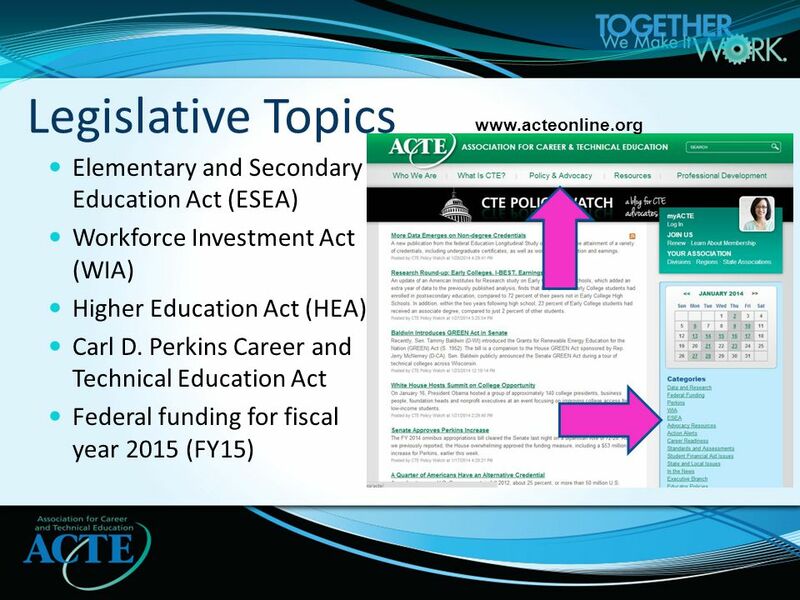 Be sure to stress the need for investment in CTE education and that any cut in funding is unacceptable! Use data and success stories to highlight your point. Explain that without federal funding and support these programs are not possible! 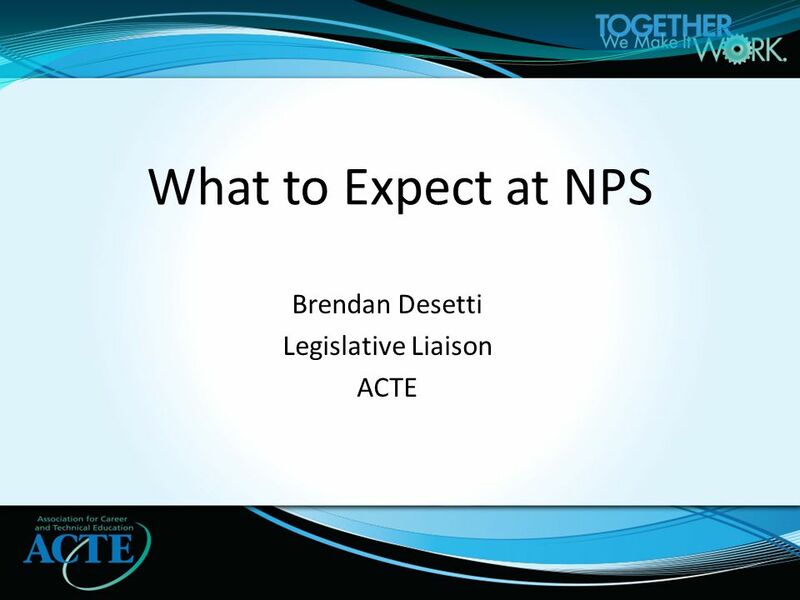 Download ppt "Brendan Desetti Legislative Liaison ACTE What to Expect at NPS." DO Day on the Hill Information Session Wed. April 6 th 5pm Ginsburg Auditorium. 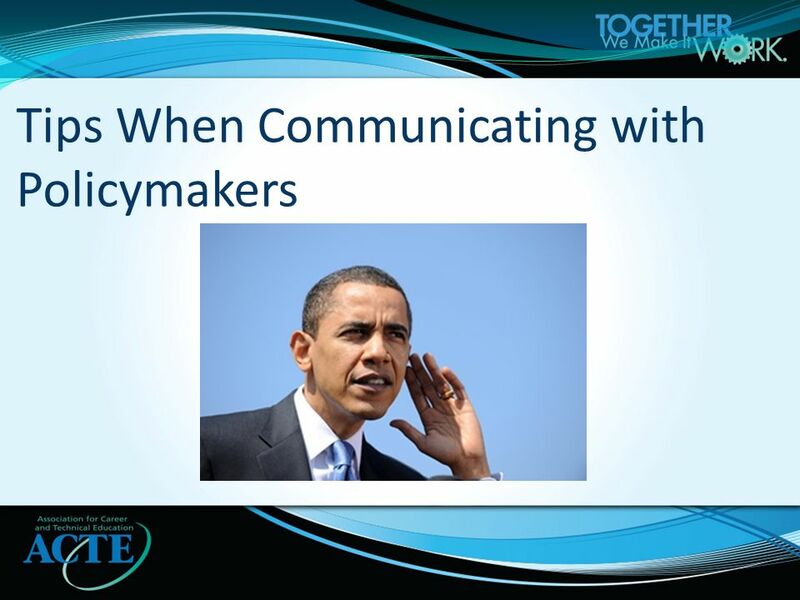 Communicating ASLAs Policy Agenda An Advocacy Webinar from the ASLA Washington Office. 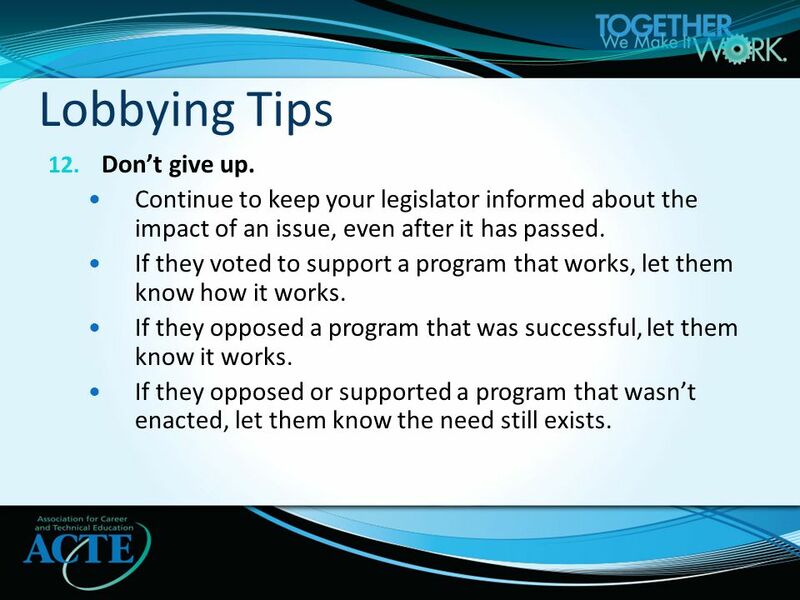 Advocacy for Everyone- Meeting and Building Relationships with Legislators and Staff ! Robert Robert Riedel M. M. Christopher Tabakin CAN CAN Coordinators. ADVOCACY FOR THE REST OF US Goals: Skills for you to make a positive difference for your food program and your community Resources to help you be an effective. Advocating for Sectors on Capitol Hill NNSP National Conference Planning Call - October 21, 2009. What Makes for a Good Research Presentation? Adapted from: Tom Carsey University of North Carolina Chapel Hill. Be Prepared, Be Polite, Be Persistent Presented by Mary Griffith, MN, RN To advance and promote professional nursing in Arizona. CUBE: Urban Advocacy Skills Building How to Tell the Urban Public Education Story: An Important Tool for Successful Advocacy. USING PARENTAL CLICHÉS AS A GUIDE TO POLITICAL SUCCESS Presented by: Carolyn Logue CA LOGUE Public Affairs REAL PEOPLE CAN BE POLITICAL TOO! 1. “You, Your Experience – Together, Our Voice” THIS IS NOT A TEST! 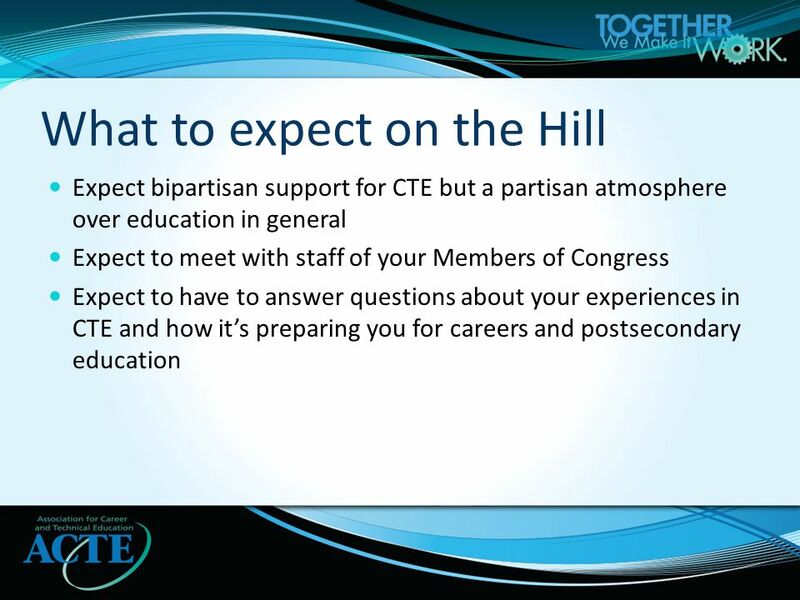 Preparing for Your Capitol Hill Visit Todd Handler– Member, State and Local Policy Subcommittee. Conservation District Supervisor Accreditation Module 11: Building Legislative Relationships. Advocacy Education and Strategies: Public health and the legislative process Wisconsin Association of Local Health Departments and Boards. Advocacy Active support of an idea or cause, especially the act of pleading or arguing for something. Key components Knowing your objective Understanding your audience. 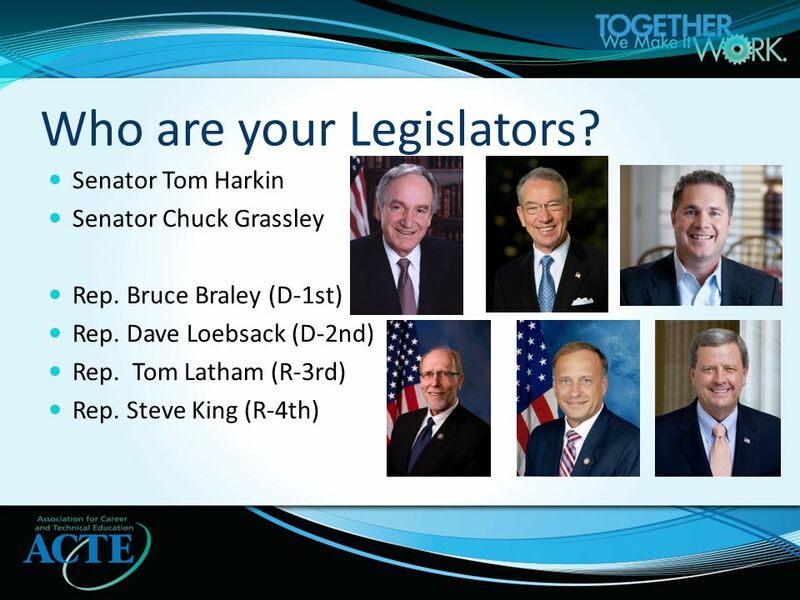 Overview of advocacy What it is What it does Why do it Role of ACHA leaders and members. Lobby Day Training NC MEDICAID EXPANSION LOBBY DAY Wednesday, June 4. Training Module 10. 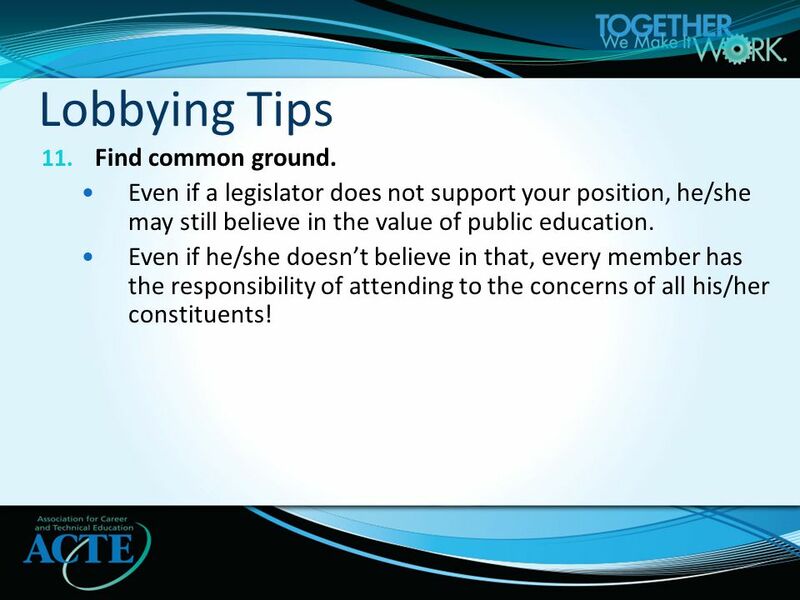 What You’ll Learn In This Module Why it is essential to maintain good legislative relationships. Why positive messages are key when. What to Know Before You Go! YWCA USA. 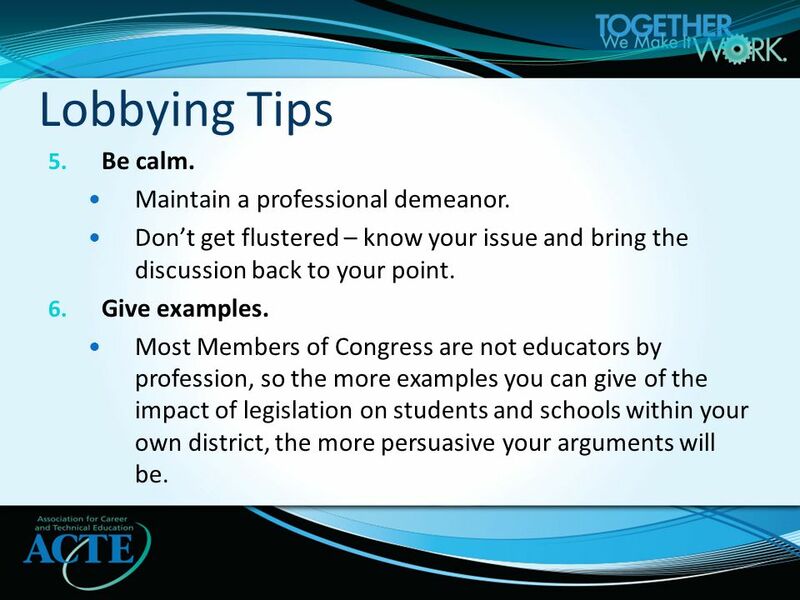 Your Checklist Three Homework Assignments Five Keys for Being Heard on Capitol Hill Logistics About the Webinar. 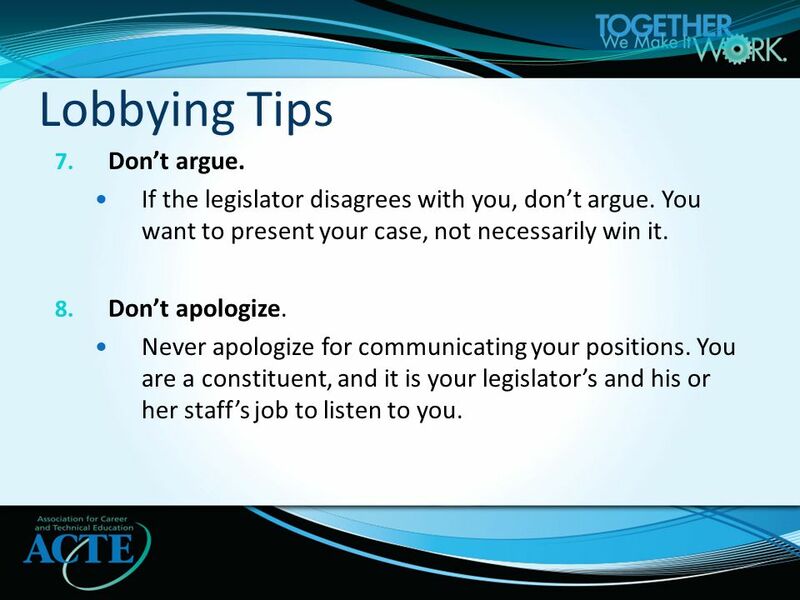 The Art of Advocacy A Legislative Toolkit. Who Me? A Lobbyist?! 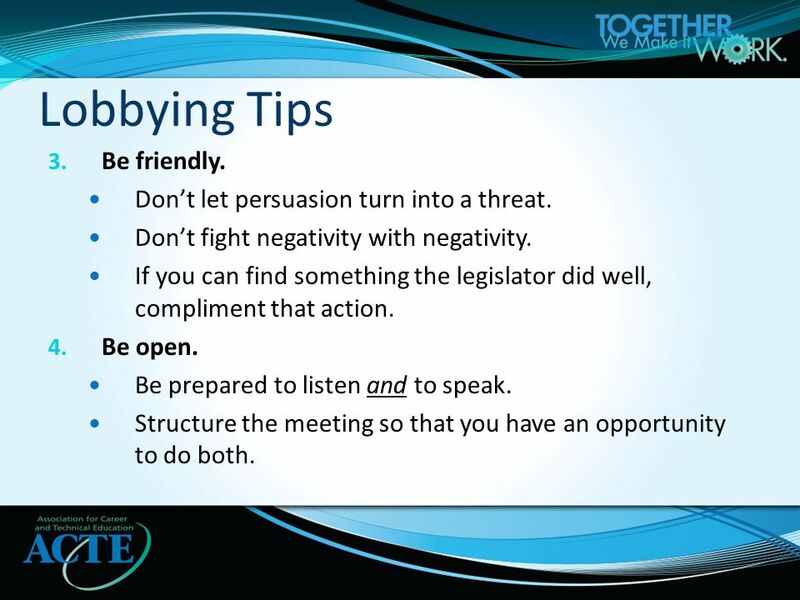 Lobbying is the process of gathering information for the purpose of persuading someone. Navigating Capitol Hill An Advocacy Primer Mitch Coppes Legislative Liaison ACTE Brendan Desetti Legislative Liaison ACTE.